In the busyness of the work week, coming home and throwing dinner together each night can quickly become a burden. My favorite part about cooking (besides eating, duh) is trying new recipes, but I don't often want to try something new on a weeknight without knowing how long it might end up taking, or if it will even be tasty once I go to all the effort. I found this recipe linked on this blog and thought it sounded delicious. I was pleasantly surprised to find that per the recipe's instructions, this whole dinner really only took 25 minutes (so many times those recipes lie! ), AND it was delicious. I don't often cook with lamb (read: never), so I substituted ground venison. Substitute with your preferred ground meat and you have a delicious and easy weeknight dinner! Heat broiler. In medium bowl, combine the meat, apricots, coriander, chopped onion, 1/2 tsp salt, and 1/4 tsp pepper. Form the meat into 1 1/2-inch meatballs (about 20) and place them on a broiler-proof baking sheet. Broil until cooked through, 8-10 minutes. Meanwhile, place the couscous in a bowl. Add 1 cup hot tap water, cover, and let sit for 5 minutes. Fluff with a fork. In a small bowl, mix together the oil, lemon juice, and 1/4 tsp each salt and pepper. 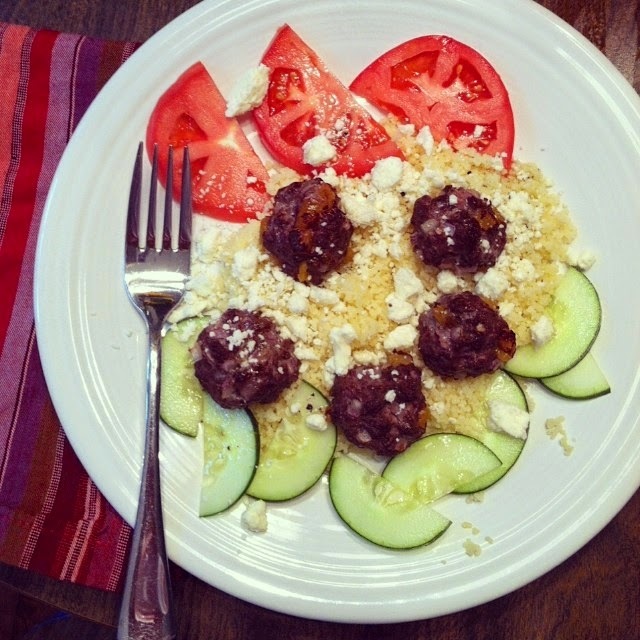 Serve the couscous with the meatballs, tomatoes, cucumber, and Feta. Drizzle with the dressing. Looks good! Although, I would never use venison (and I can't believe you did!! ), but ground beef would be delicious. I've never tried meatballs in the broiler, but that's such a quicker way to do it!